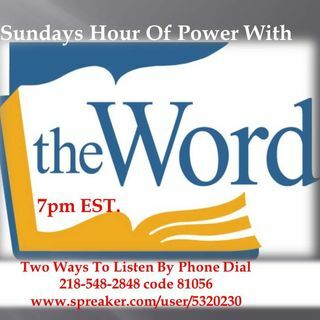 3rd Sunday Hour Of Power w/ The Word-Guest Speaker Pastor Nino Akridge | 3rd Sundays Hour Of Power W/ The Word!! From: 3rd Sundays Hour Of Power W/ The Word!! join us every 3rd Sunday for a message from a guest speaker, we thank you for supporting this service monthly, brought to you by TMA Radio Broadcast and The Circle Of Love Prayer Partners!! 7pm est. C'mon Pastor..we need people that will pray with us.. Put all our trust in God..
Amen...its time to prepare..stock up..